You can often read in Thailand forums that driving in Thailand with your own scooter, motorcycle or any other vehicle is far too dangerous. Mostly such comments come from the big tourist centers like Pattaya or Bangkok where the traffic is really catastrophic sometimes. Of course it is not without danger, especially on some of the main roads or along the beach road in Pattaya, to find your way between the many cars and left-hand traffic. It is also true that Thailand is one of the most dangerous coutries wordwide when it comes to deadly road accidents. Nevertheless for me, my own vehicle is indispensable in Thailand. I just do not feel like relying on any public transport to get from A to B. In addition, the really dangerous roads are limited to a few. Outside of the cities on the country roads, it’s even fun to curve with a scooter or motorcycle. However, one should not underestimate the local scooters. They usually have 110 or 125 cc engines and that means that in Germany they would be allowed to even drive on our motorways. The slower smaller scooters of the 49 cc class with a maximum speed of 25 or 50 km / h I haven’t seen here yet. So you should know how to ride a bicycle since you don’t want to have an accident in Thailand. Having your own scooter in Thailand has many advantages: you will almost always find a parking spot. Except maybe in the evening along Pattaya Beach Road, Bangla Road in Phuket or at Ao Nang Beach near Krabi). You can always drive an go where you want and you don’t need to wait for a public transport. In addition, these scooters are quite cheap. Prices start at about 30,000 Baht and for about 45,000 Baht you get even an original Honda Wave. Scooters consume well under 3 Li / 100 km of fuel. Of course, you can also rent a scooter on a monthly basis. They are available for about 2500 Baht / month from the relevant rental shops on site. This is a good solution for people who are in Thailand for a few month only and have no garage for it during the time of absence. However, if you have an accident or this rental scooters are stolen, you will be asked to pay the full price for a new vehicle. I know a few people who went on a big tour in Thailand with such a scooter. For example, up to Cambodia or for a visa run to Malaysia. 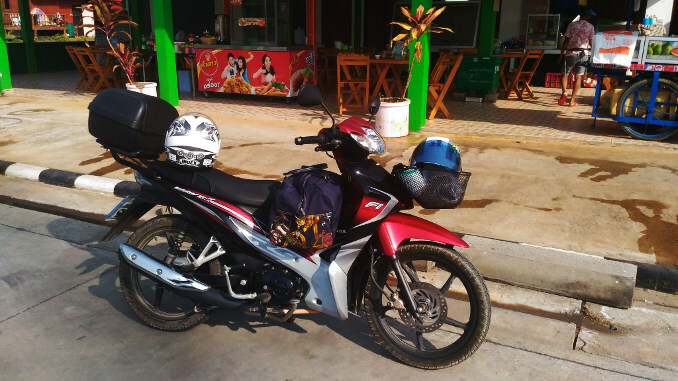 The longest tours I have done with my Honda Wave by myself led from Krabi to Koh Samui, Koh Lanta, Phuket and Khao Lak. In earlier years I also went more that once from Koh Samui to Krabi or Phuket with an old Honda Dream 100cc. Nothing is impossible in Thailand. Why a scooter and not a car? A car is only worthwhile for Farrangs who really live full time in Thailand. Even used cars in bad conditions are still relatively expensive in Thailand. At least if I compare the prices with Germany. In addition, it is always difficult to find a parking space, especially at the tourist resorts. Used cars in goof conditions usually cost upwards of about 150,000 Baht. A new small car, such as the Toyota Yaris (which is made in Thailand), with basic equipment costs from 480,000 Baht upwards. Of course, such a car has the advantage that you always stay dry, while you have to hide with a scooter in a heavy rain. But since the weather is mostly sunny in Thailand, I would not want to give up my bike.